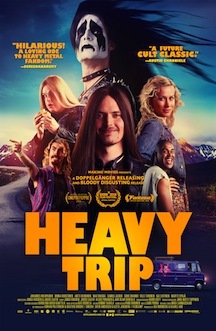 The first directorial endeavor by the winning team Juuso Laatio and Jukka Vidgren tells about an unheard Finnish heavy metal band that embarks on a crazy trip to Norway in a desperate attempt to perform in the Northern Damnation Festival. They are eager to make everyone proud in their rural little village, Taivalkoski. The four members of the band are very peculiar, starting by the lead vocalist, Turo (Johannes Holopainen), a tranquil, introverted fellow who is easily transformed into a powerful roarer whenever holding a mic. Turo works in a mental institution and nurtures secret feelings for Miia (Minka Kuustonen), a childhood friend. Pasi (Max Ovaska) plays the bass and might not be totally normal. He works in the local library and remembers every song he hears. Lotvonen (Samuli Jaskio) is extremely fast on guitar and efficient in slaughtering reindeers in his father’s farm, while the drummer, Jynkky (Antti Heikkinen), is considered the toughest guy in the band. However, he often faints while playing due to lack of oxygen in the brain. These talented musicians never played live before, but envision their big opportunity when the manager of the cited Norwegian festival (Ville Tiihonen) made a traumatic stop by the village. Although upset with the sordid events of his short visit, he accepts a demo containing one sole brutal original inspired by the sound of a reindeer grinder. While waiting for a response of the manager, Turo tells Miia he’s heading to Norway with the band in order to impress her. They suddenly earn reputation, stepping up from losers to heroes, and even get to open a concert for Jouni (Ville Tiihonen), the swaggering vocalist of a soft-pop band who is flirting with Miia for quite some time. The concert becomes memorable, but for the worst reasons. After being informed they wouldn’t be playing the gig, the quartet, now called Impaled Rektum, adopts the fearless attitude of true metalheads and rashly prepares for the trip. However, a last-minute incident forces them to recruit one of Turo’s intimidating patients, Oula (Chike Ohanwe). They steal, commit profanation, and almost provoke a war between countries. Yet, nothing dissuades them from their goal, not even Miia’s super-protective father (Kai Lehtinen), a rigorous cop who, at the right time, decides to give a chance to Turo, the man he comically designates as the glue-sniffing criminal.